Cette maison est difficile à décrire avec des mots! Idéalement situé à 2 miles à l'est de Packwood, Washington et 2 ½ heures de Portland ou Seattle soit. De la maison, il est à seulement 20 minutes de route de White Pass Ski Resort qui a le double de taille cette année avec plus de 700 acres de ski, 2 nouveaux ascenseurs et un chalet de montagne mi. Avec Deux Master Suites, une troisième chambre avec un lit queen, un futon double dans la salle des médias et deux futons simples dans la mezzanine (seulement pour les enfants), cette maison peut facilement être partagé par deux familles. Étant construit sur la rivière Cowlitz et ayant une vue imprenable sur le mont Rainier ne sont que deux des commodités étonnantes de cette maison. Le bain à remous est près de la rivière pour vous détendre après une longue journée de randonnée ou de ski. Un foyer extérieur est prêt à faire griller des guimauves. Une salle de presse est en attente pour vous avec les derniers équipements de divertissement électronique. Lorsque vient le temps de cuisiner, vous trouverez la cuisine entièrement équipée d'un endroit merveilleusement cuisiner et recevoir. Ou si vous le souhaitez, vous pouvez faire cuire sur le barbecue à gaz à l'extérieur. Un foyer à gaz dans le salon rendra vos soirées très agréable. Réservez dès maintenant votre séjour! S'il vous plaît appeler si vous avez des questions. 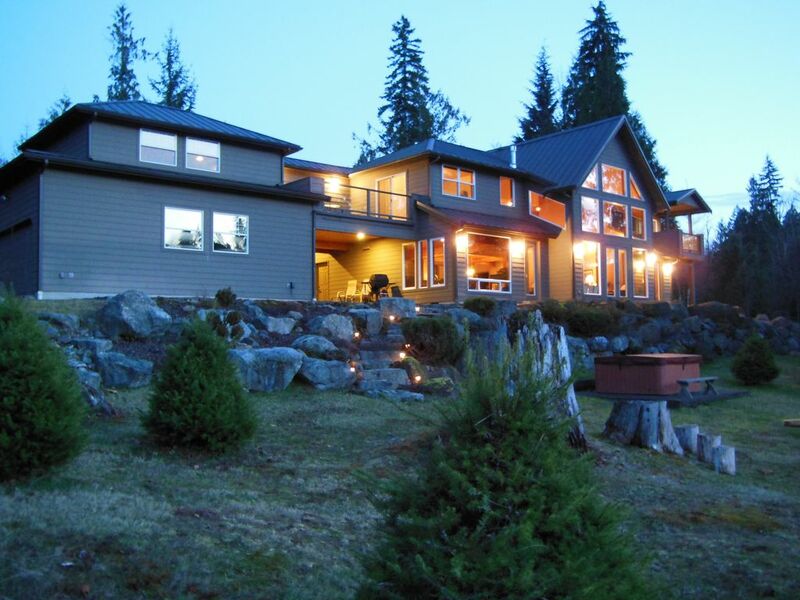 Well appointed house, great for a large group (we were 6 guys) for a getaway cross-country / downhill ski week-end at White Pass. The setting on the river is beautiful. Having a property manager living on the property is an added bonus if anything goes wrong. Suggestion: The restaurant choices in Packwood are limited and not very good. The local supermarket is pricey and has limited offerings (meat and produce) and the house has very limited supplies (spices / condiments / bath soap, etc). Recommend, you do some menu planning and bring up most of what you will need for the week-end. We cooked breakfast and dinners at the house and did lunch as the mountain lodge. We really enjoyed the house - it is great to have multiple master bedrooms. The media room is big and great place to hang out. The round dining room tables are great for playing board games in the evening. We had the fireplaces going each day. We had elk in the yard on two different days so that was fun. The house is well stocked with all the pots, pans, kitchen tools we needed. We were there during winter so the snow was fun to play in and sled on. We skied at White Pass which only 20 minutes away. The house is 10 minutes away to Packwood and there is a new brewery in town that we visited a few times and a few trips to the coffee shop. Packwood is big enough to have an IGA for anything we forgot. The onsite grounds keeper is great - very helpful and friendly. Absolutely beautiful home and dog friendly too! 5 stars all the way! My husband and I had a wonderful time in this beautiful home. My husband is an avid snowboarder and I love cooking so close proximity to White Pass and a huge fabulous kitchen made this the perfect getaway. We were originally only supposed to stay for a few nights but ended up extending our stay for two additional days because we were having such a fabulous time! I loved being so close to the river and was lucky enough to see driver otter! We were also able to bring our dog, a black lab/Taiwanese mountain dog mix, and he did not want to go home at the end of the trip! Would highly recommend to everyone and we’ll definitely be back! Beautiful home!! HUGE space! AMAZING VIEWS!! this home is amazing. The lay-out, the view, the accommodations, all of it. we spent our family Christmas here the weekend after Christmas. They had a huge christmas tree that was beautiful. Sadly there was no snow, but it is hit or miss this time of year. The house is huge and enough room for everyone, including the dog. The Views are breathtaking. Having the caretaker on the property was reassuring. The ONLY reason i gave 4/5 is it would be good to update the beds/mattresses/pillows. Thank you for sharing your beautiful home! we will be back! Thank you Heidi! We will take a look at the items you mentioned and get them updated. Happy New Year! Third year in a row! Our family loves this place! Incredible location and home! Grounds keeper insures you have 100% satisfaction. Convenient to paradise, local store, gas station view great views! Everything you need! Outstanding! Great kitchen, great backyard course- Jim was the best! We stayed 2 nights prior to the Bigfoot 200 mile race and 2 night post race. We couldn’t have asked for a better home away from home. We meal prepped, cleaned the gear and chatted with Jim. The home is very well taken care of and it was very accompanying to my group of 7. The day after the race in which my brother competed and finished - Jim went and got us the local paper so we could read the nice write up about the race. If you are looking for a peaceful home- this is it. The views....amazing! We enjoyed the back yard very much. I would recommend this home.